description material size care and instruction sofa set 5 seater and coffee table patio canning ( rattan) with powder coated iron base sofa : h38 back, w 20 xd 20 . Table 18x30x20 washable, comfortable, light weight. Sun proof, water proof. Good for garden, pool side, terrace. Keep sharp things away. 5 seater comfortable sofa set. 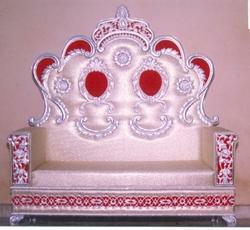 Made up of Marandi and pine wood. We are one of the renowned industries which are providing several kinds of supreme quality Metal Comfort Sofa in the market.